Diversity is a hot topic in children’s literature thanks to campaigns like We Need Diverse Books, and rightly so. We all gain in so many ways from the ability to find ourselves in literature. The joy of living in the Middle East for big chunks of each year, as I do, is that the local literature is as diverse as the local community of authors, making it a great place to live, read and write. Our International Writers’ Centre is dedicated to creating unity through diversity. “Hello. I’m thrilled to be part of tonight’s events. I remember being here at the opening night, last year, listening to the words of Ben Okri and the poetry of His Highness Sheikh Mohammed bin Rashid al Maktoum. Even amongst those incredible voices, one speech stood out for me – and that was Noura Al Noman’s description of the support she’d received on her writing journey. The more Noura talked, the more I found myself nodding as I realised how lucky we are to have such a generous writers’ community in the UAE. A community that’s rooted here, in the wonderful people who make up the Writers’ Centre team; in the wonderful people who are genuinely committed to creating unity – and community – from diversity. People often think of writing as a solitary pursuit. And, in some ways that’s true: writers spend a lot of time in their own heads, which can be a scary place to be. Sometimes we see no one but our family for weeks. Sometimes we spend days in our pyjamas. Sometimes we go so long without interacting with anyone that we forget how to speak human. Writers have to come out of their caves occasionally. Like grizzly bears looking for sustenance. And at those times we can be needy. So it’s wonderful to know that the Writer’s Centre team are always here to ‘feed the bears’. In contrast, by showing how much they value all of us in this diverse UAE writing community, the Writers’ Centre team have succeeded in touching my (slightly-prickly) heart. I’ll give you an example of how. I struggle with insomnia and I was anxious about a recent writers’ event that I knew would require levels of charm and wit and, well, awakeness, I didn’t think I could manage. But the minute I entered the room I was swept up in a wave of kindness from the Writers’ Centre team, who knew exactly how to make me feel better . . . At least four people offered to take me straight to the cake table. And love and support aren’t only important when you’re feeling low. It’s also great to have people in your life who’ll jump up and down with you when you’re on a high. There was a week last year when my book was nominated for three different awards. Being British, I get fidgety about success: the world felt too good to be true and I was bouncing off the walls with hyper-excitement. Then, into the lunacy, a beautiful bunch of flowers arrived with a note from Isabel Abulhoul and the team. I was touched that they’d noticed and were sharing my glee – albeit in a slightly more dignified and less squealy manner. Love and support may be key to a happy life, but writers – at least the ones I know – aren’t good at just being happy. We want ‘happiness plus’ – happiness plus meaningfulness. Happiness plus fulfilment. We want to achieve something. We want to make a difference. Maybe we will, maybe we won’t. But it’s something all writers I know aspire to. And no matter how much we love writing, some days we need help finding the spark that will deliver that ‘plus’. I have been known to find mine at the bottom of a box of donuts, but more often I’ll find it through the Writers’ Centre’s ability to connect me with a wonderful mishmash of diverse writers and thinkers from all over the world. I wrote a blog recently, saying how much brighter I feel when my comedian and writer friends are around me (you can read that blog here). Brian Eno used the word ‘scenius’ – scene plus genius – to describe the creativity that the right kind of ‘scene’ can generate. The theory is that in a like-minded group, everyone becomes better than they are on their own – sharing ideas, encouraging risks, competing, while still offering support and understanding. It certainly works for me – and it’s something the Writers’ Centre helps to foster. I think Brian Eno would love it here, sharing a nice cup of tea with Isabel, Yvette, Ranya, Naouel, Lucy, Hind, Jeric and the rest of the team. Writers, wherever we come from, are united by a desire to believe anything is possible. I often open the curtains, hoping to be sprinkled in fairy dust and shown how to fly. I secretly expect to be offered my very own chocolate factory any day now – complete with Oompa Loompas – and I dream of walking into my bedroom and finding Dobby the house elf alive and well and perched at the bottom of my bed. Because real life isn’t always perfect and it helps to have something magical to banish the darkness and make us smile. I often wonder if I became a writer just so I could escape to a magical imaginary world whenever I wanted. The Writers’ Centre encourages that. I was the story teller at the Harry Potter evening held here last February and the event had an amazingly enchanted atmosphere. I can still picture Diagon Alley over there. Not a day goes by when I don’t miss my amazing Lucius Malfoy cane . . . Yes, despite this charming Gryffindor exterior, I suspect I am a secret Slytherin. And I can still feel the magic in the air. Rachel is a graduate of both Oxford University and Cambridge University and has put her education to good use by working in an ad agency, a secondary school, a building site and a men’s prison. Her interests are books, films, stand-up comedy and cake, and she loves to make people laugh, especially when it’s intentional rather than accidental. 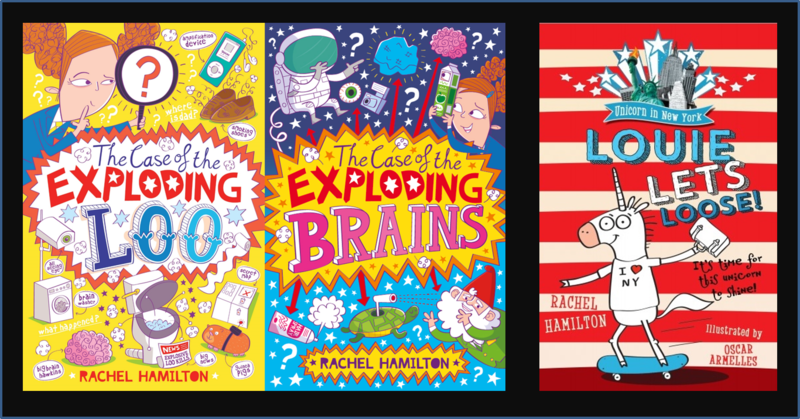 Her books include Unicorn in New York (OUP, due for release in 2016), The Case of the Exploding Brains (Simon & Schuster, 2015) and The Case of the Exploding Loo (Simon & Schuster, 2014), which was nominated for the Redbridge Children’s Award, Leeds Book Award and won the Worcestershire Awesomest Book Award. She recently won the Emirates Woman of the Year Award 2015 and would like to thank everyone who voted. Great speech. I love the term “scenius” – it is hard to write in a vacuum, other creative people around you at least some of the time does make a difference (I don’t have that enough I’m afraid). Sounds like a great writing centre and well done on your big award. I’m also a big fan of stand up – I listen to both the Comedian’s Comedian podcast and the Richard Herring podcast – the Comedian’s Comedian podcast is great because it’s all about the creative process which is always fascinating.